It’s an old journalism maxim: When someone is down, someone else must be up. Such is the case with Aereo and RCA. In the wake of Aereo’s abrupt shutdown after losing its Supreme Court case last week, RCA, one of the pioneers of television and antennas, is pointing out that its product can capture the same broadcast signals as Aereo’s (although without some of the bells and whistles Aereo had offered). 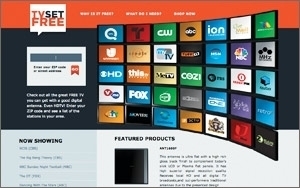 To that end, RCA is directing consumers to a Web site, www.TVSetFree.com, where consumers can find the correct antenna for their home. The site also educates consumers on DVR solutions that can be paired with these antennas for added functionality. “In the last couple years, our sales have ticked upwards, as consumers move to streaming boxes and cord-cutting in general,” Geise says. For the immediate future, RCA isn’t planning on much more than some consumer outreach through public relations. But Voxx executives are working on a revamped Web site and educational effort about the importance of having a digital antenna — even if you subscribe to pay TV services -- coming this fall, Geise says. 1 comment about "RCA Courts Aereo Customers". Edmund Singleton from Winstion Communications, July 2, 2014 at 6:42 a.m.